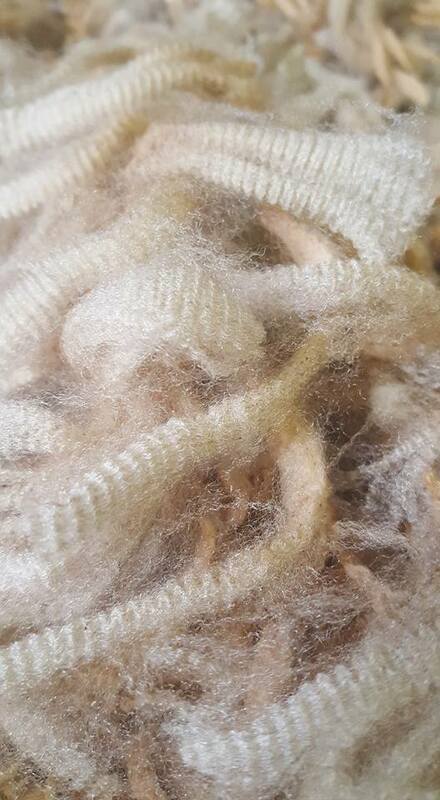 This week we introduce Jen Eddington of Curly Wool from Tasmania, who has a multi-generational love for fiber. From breeding and raising sheep to dyeing, spinning and weaving, she enjoys all aspects of working with wool. Her studies in fiber arts have taken her all over the world – most recently to Fibery Goodness! Arlene Thayer (AT): Tell us about being a “fiber” person in your part of the world, Tasmania? 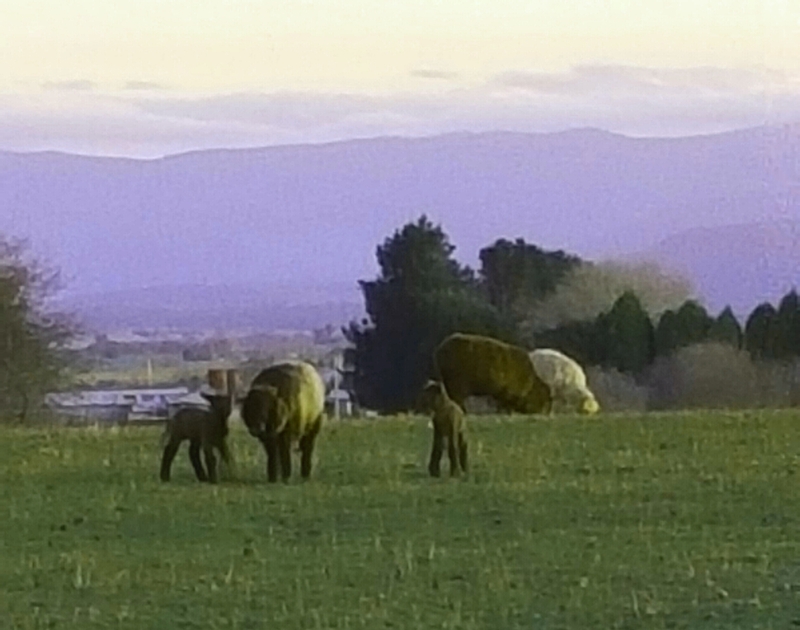 Jen Eddington (JE): My island state of Tasmania has a long history of growing wonderful wool. In the past we have had fabulous woolen mills; all but one has closed with the trend for off shore processing. Tasmanian Merino is famous and sought after by the most prestigious weaving mills in the world. Early settlers brought Merinos from Spain and France. Interestingly it was the women who did most of the selection of stock and the breeding programs but their husbands largely took the credit. I have a four generational link to the breeding of sheep as my Great Grandfather was a convict shipped at the age of 16 from the Isle of Lewis in the Hebrides for sheep stealing. He was a crofter and weavers son. I have been involved with sheep breeding all my like with interludes of working in various overseas countries. AT: What kinds of animals do you raise? 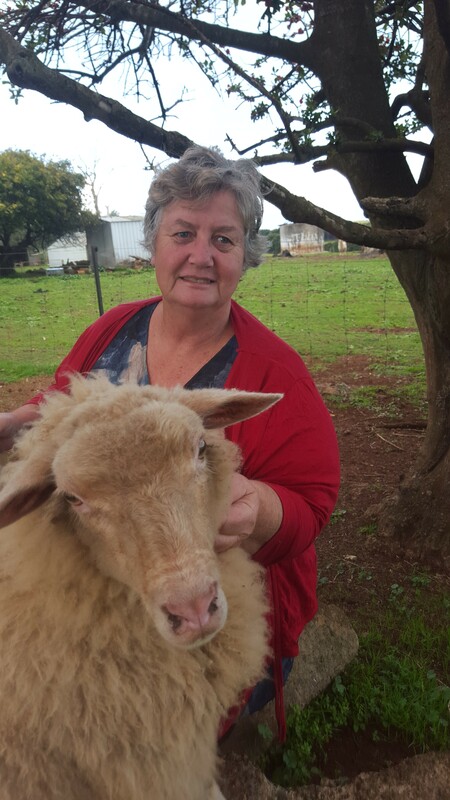 JE: I farm with my husband Tim and we have a commercial flock of merino and white Suffolk’s for wool and fat lambs. I also raise my pride and joy English Leicesters both white and coloured. As a spinner I also keep some other interesting variety Border Leicesters, Finns, Morrits and some crossings for nice spinning experiences. We also raise Angus cattle for beef and have 4 alpacas as pets from the USA in the `80`s when the industry was begging there. AT: Describe all the different fibery things you like to do — spin? knit? weave? JE: I do lots of fibery things and have a Diploma in Contemporary and Visual Arts (Textiles). I have in some ways gone through stages of loving something more than others . I always return to dyeing and spinning and knitting. I love to felt and I do weave but only at this point on small looms. 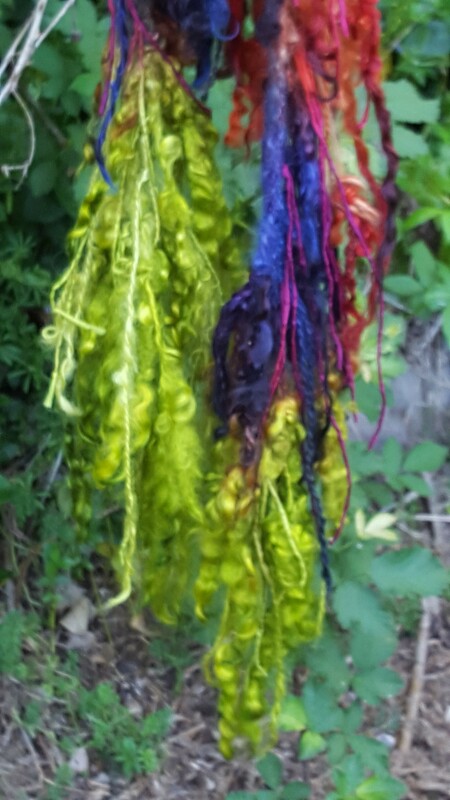 I really enjoy Natural Dyeing both of yarn and fabric including eco printing. I use mainly Australian plants. Last year however I studied Natural Dyeing in Japan. AT: How did you get started with all this fiber stuff? JE: Gosh I don’t think I remember. My Aunt taught me to knit when I was quite young . Of course I was always around wool. In the seventies (sounds so long ago), I bought my first wheel when it was trendy to spin and knit those lumpy bumpy greasy jumpers. I also worked in a historical tourist place for a time where me spinning was part of the attractions. Boy have we evolved . AT: Which fibers to prefer to work with and why? JE: Wool is my first love . Having said that, I was pretty passionate about cashmere for 10 years or so and spun a lot of fine yarns. We also sent our cashmere clip to the USA as there was no dehairer in Australia and had our own yarns made and dehaired cashmere for spinners. I love to add silk to work but I am not very sold on some of the fibres like banana, soy, etc. AT: You seem to be a life long learner…what is on your wishlist of things you would like to learn? AT: You also have some experience with silk worms, too, right? Tell us about that. JE: I have a little experience but by no means expert. I have grown them a few times and I spin silk. While in Japan I had the opportunity to see several silk work worm farms and spinners harvesting the cocoons. I also went hunting with my dye teacher for wild silk worms in the forest and we found some and they have a delicious lime green cocoon. AT: I saw on your Facebook page a picture of Frisbee, the sheep. 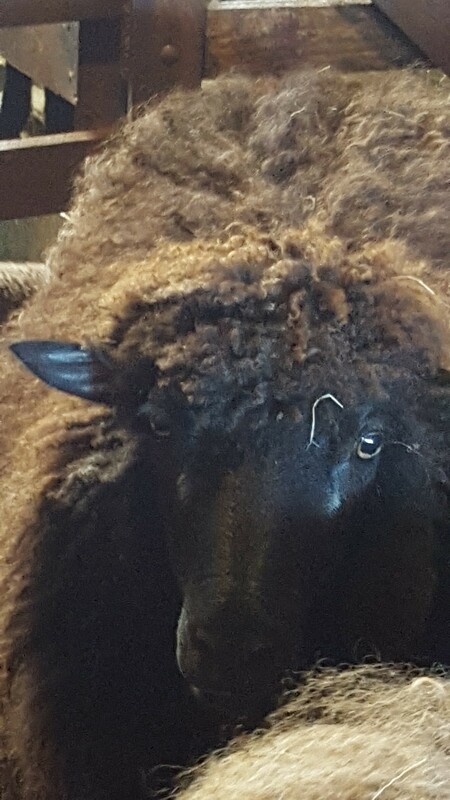 He seems like a special sheep. What is his story? JE: Frisbee is about 15 and was raised by one of my now adult daughters. He was found on the road as a baby by a motorist and they dropped him at our house. He was not from our flock but he needed feeding. He is a Corriedale. I also have a cashmere buck who is over 20 and who has many relatives in the USA. There are three other pets that don’t think they are sheep. 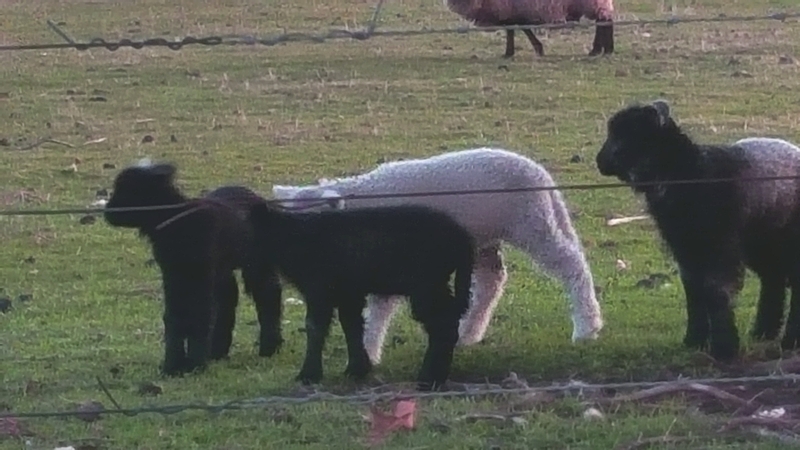 Liquorice who is now very old and has bred me many fine English Leicesters, Smiley who is 2 and a Black ewe and this season, Lamb has been raised as a pet she is a Finn and hates other sheep. AT: You’ve been studying the Redding Method of Dyeing Protein Fibers over the last year, were do you think your new skills are going to take you? AT: As an active member of our FG community, tell me, how did you find us? JE: Do you know I cannot even remember. I do believe it was from a link on your blog which I began to follow. I am so pleased I did find it. I was not aware of Natalie at that time. I did however discover later that a couple of friends on Mainland Australia had been getting Scrapboxes for awhile. AT: Do you have any other interests besides fiber? JE: I have lots of interests reading , gardening I love flowers and chooks (chickens). I also was very active in our equivalent of the PTA which led to National Representation and an award. I was involved in this space in working with Education and government on policy etc. I retired last August but I am still doing a little consultancy. AT: What is your secret guilty pleasure? JE: Sleeping in. I am a night owl not a morning person and cheese! AT: Thank you so much, Jen! It is fascinating to learn a little bit about your corner of the fiber world. 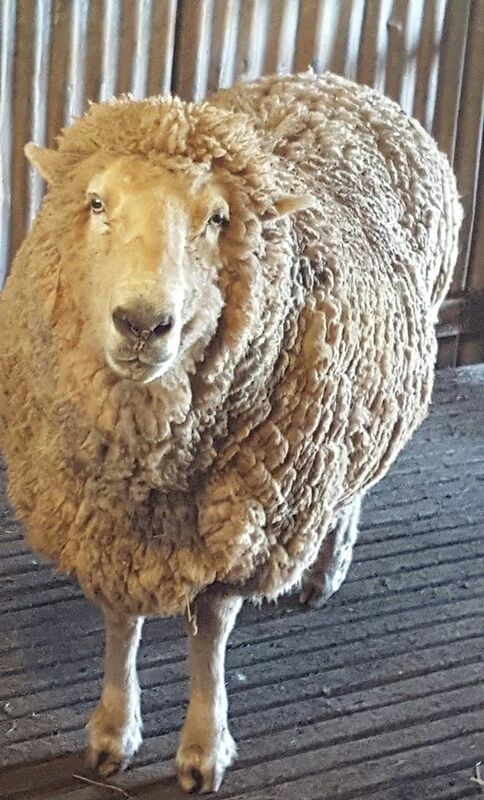 I like forward to seeing more updates on the Curly Wool Facebook page!! ← Making Magic with your Majacraft Aura – Free online Live Session! Great article! So glad to have had the opportunity to be in class with you. Wonderful to get to finally “know” you. If you got alpacas in the 80’s are they still alive? And what are their typical lifespans? Beautiful sheep and a lovely lady too! Would love to have a cup of coffee with Jen. Lots to learn! !